What's that Thing: A Brief History of Reflective Pavement Markers. Blue RPMs are designed to catch the eye of emergency vehicle drivers as they indicate the presence of a hydrant on the side of the road. What’s That Thing is Slate’s column examining mysterious or overlooked objects in our visual landscape. To submit suggestions and pics for future columns, send a description or a pic to whatisthat@markvr.com. Driving along a stretch of American asphalt in the dark of winter, you may notice that the road doesn’t seem to get quite as dark as it used to. One reason? Those little reflective bumps along the pavement. 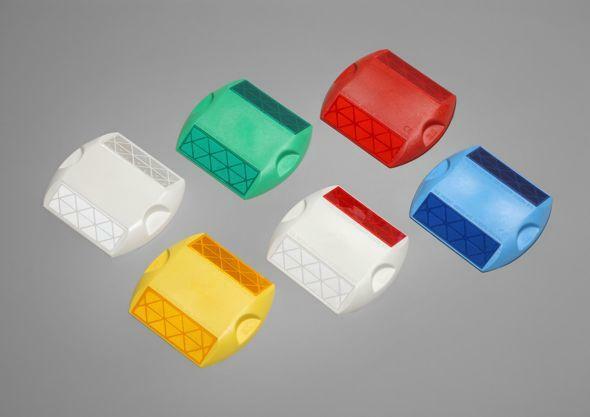 Some of these reflectors come in unsurprising colors—red, yellow, white. What about the blue ones, though? And the green ones? Are they purely an aesthetic choice, or is there a reason behind the color variations? 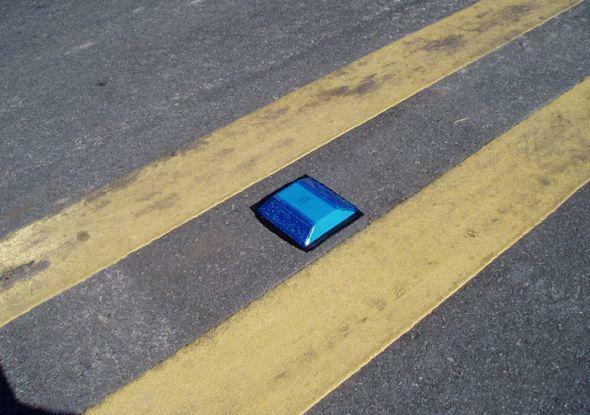 Brent Johnson, general manager of the well-named Centerline Supply Ltd., in Grand Prairie, Texas, told me that these reflectors are called pavement markers, raised pavement markers, reflective pavement markers, or RPMs. * And it turns out the colors do have meaning. Red, as usual, is bad. It typically indicates you’re going the wrong way. If you turn around—probably a good idea—the RPMs will likely appear white or yellow to those driving in the correct direction. Yellow (or amber) markers typically show the center line of a road, or the left edge of a one-way road. White markers separate lanes of same-direction traffic and may also appear on the right edge of the road. Blue RPMs are designed to catch the eye of emergency vehicle drivers as they indicate the presence of a hydrant on the side of the road. Steven Cole, president of the Reflective Tape Store, notes that blue markers are typically placed at the center of the road or on the side. If the hydrant stands at a corner, then each road might have its own marker. Marcia Lozer, a spokeswoman for 3M Roadway Safety, notes that blue RPMs may also indicate emergency entrances onto roads near firehouses—so they’re something even regular motorists might want to notice. Green RPMs have several purposes. They’re most often used on roads around gated communities to indicate access for emergency vehicles. Utility companies may also deploy green RPMs to help them find roadside installations quickly, especially in an emergency. Cole also notes that red and green markers may be placed on private roadways, e.g. around factories, to “restrict or open areas to automobiles and traffic.” And markers of all colors go off-road. Hunters may use them to mark trails; homeowners, to highlight driveways or paths; warehouses, to indicate where pallets should be stacked. RPMs have some fascinating historical precedents. Every British motorist will be familiar with cat’s eyes, patented in 1934 by Percy Shaw, and named for how feline eyes seem to glow (a consequence of cats’ extraordinary night vision). The value of cat’s eyes to road safety became literally apparent in World War II blackouts (though more recently, cat’s eyes flew off the road and killed a prominent DJ). The modern RPM was born with an initial 1964 patent application, followed by another patent granted in 1986 that addressed the unique design requirements of any object that sits outside for the whole year on a busy road. A reflective marker must exhibit “economy and ease of manufacture, high-quality optical performance, impact resistance, weatherability and resistance to chemicals encountered on the roadway and ability to withstand a wide range of in-service temperatures.” There are also snow-plowable RPMs. 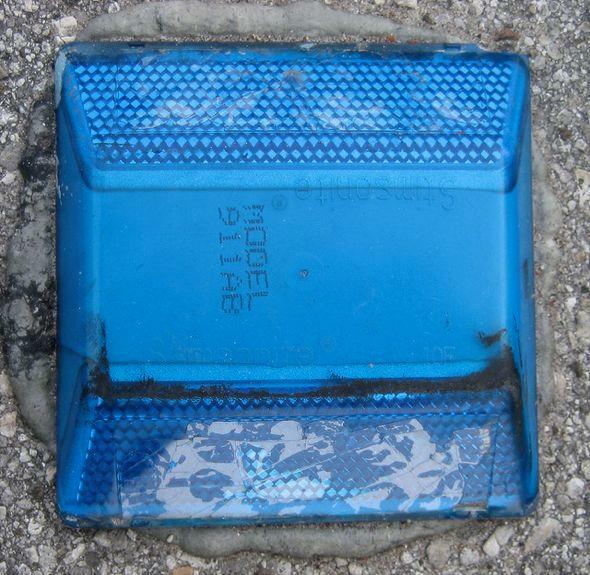 The purpose of pavement reflectors is, of course, to save lives. They have been shown to help drivers see lanes better and sooner, especially when it’s raining, and to cut crashes by 0.5 accidents per million vehicle miles. That explains why you’re seeing more and more of them. 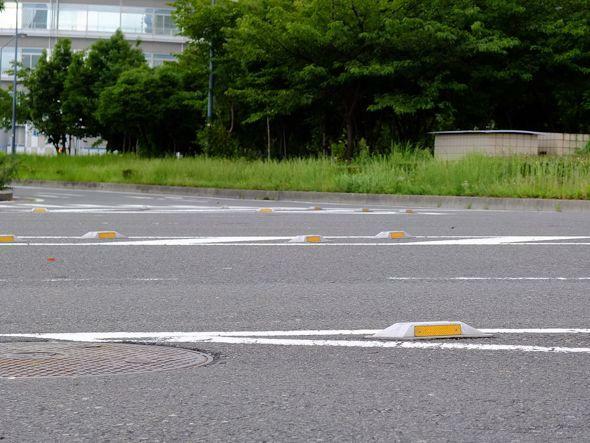 Jameelah Hayes, a spokesperson for the American Association of State Highway and Transportation Officials, told me that reflective pavement markers are an increasingly big part of how communities invest in road safety. In browsing images of reflectors, I began to find them beautiful as well as helpful. Partly it’s the sudden detail of the ordinary—we may see thousands of these every day but never look at one up close. And partly these safety devices have the attraction of anything shiny or reflective; Cole notes that some people have used RPMs to create mosaics on buildings and other public art. 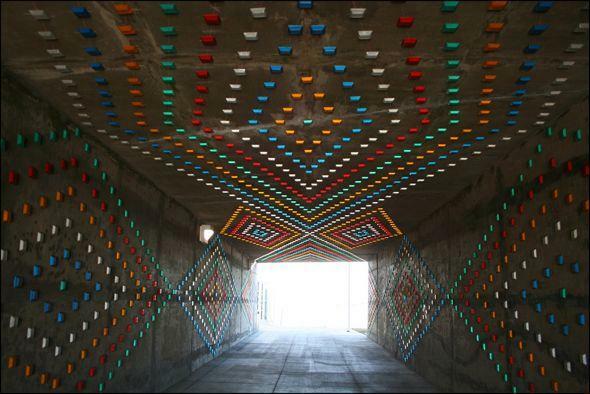 There’s a simple visual poetry to how we add reflectivity and color to the world around us. RPMs are a minor but clever part of how our species has conquered the night. For further reading on how we mark our highways and byways, head to the Manual on Uniform Traffic Control Devices. Got a bright idea for a future column? Send a description or a pic to whatisthat@markvr.com. *Correction, Jan. 23, 2014: A previous version of this post misspelled the name of Centerline Supply and misidentified its location as Prairie, rather than Grand Prairie, Texas.